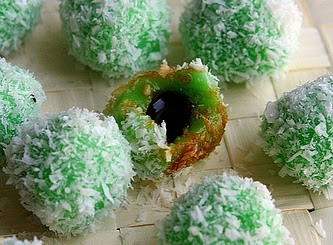 Klepon - Sweet Rice Balls Stuffed with Palm Sugar - Gutom Na! Posted on Tuesday, November 24th, 2015 at 12:18 pm. Mix the glutinous rice powder with the lukewarm water and green food coloring into a firm but flexible dough. Pull off one full teaspoon of the dough and shape it into a ball with approximately 1-inch in diameter. Push a finger into the center of the ball to make a hole, and put in approximately ½ tsp. of the grated sugar. Seal, and roll it back into the ball shape with the palms of your hands. Prepare all the balls and set them aside. Prepare a pot half filled with water and bring it to a boil. Drop the balls into the boiling water. Remove the balls with a spoon once they float to the water surface and then roll the balls in the grated coconut.